EFT Tapping is an exciting technique, developed by Gary Craig, that has the potential to revolutionize Psychotherapy and self-healing. I found EFT to be the “missing piece” that makes psychotherapy sessions with my clients extremely effective, and provides long-lasting benefits. Clients benefit by being able to quickly release old disabling beliefs, heal from old wounds, and reprogram themselves for health, prosperity, and peace of mind. Freedom from negative emotions has never been made easier than with this technique. 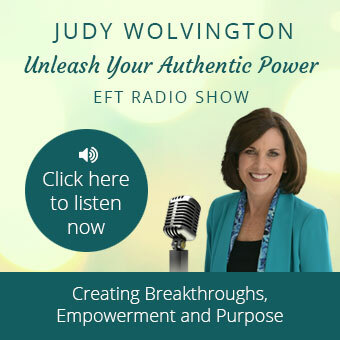 EFT Tapping has impacted countless lives and enriched the lives of people suffering from phobias, Post-Traumatic Stress Disorder (PTSD), anxiety, grief, and countless other negative emotions. EFT Tapping works in seemingly miraculous ways as the individual or therapist taps on the same energy meridians used in Acupuncture. The use of EFT Tapping in my practice has effectively shortened the long-term therapy process and has produced lasting results for my clients. EFT Tapping is based on the belief that negative emotions are the result of disruptions in the energy system of the body. Over time, we receive many disruptions to our body’s energy system in the form of “energy zaps” which occur when we internalize perceived negative statements, thoughts, or actions. These negative “zaps” stay in our memory and contribute to the formation of our core belief systems. The tapping process in EFT effectively changes old beliefs and patterns, resulting in more positive outcomes. Negative energy is tapped away, and the body’s energy system is rebalanced. By neutralizing negative emotions and balancing the body’s energy, the mind-body-spirit connection is restored and holistic healing occurs. EFT is a tapping technique, using acupressure points to balance energy. The use of EFT involves the client tapping on acupressure points on the face and torso to balance energy, while repeating set-up statements and tapping phrases led by the EFT practitioner. Through this simple process, clients are able to shift their thoughts, behaviors, and emotions, and in the process, they become the positive, creative expressions of who they are. For example, one of my clients was having difficulty with self-sabotage. He was getting in the way of completing his business goals. After a few EFT sessions, he was able to replace old beliefs such as “I’m not good enough” to “Yes, I can!” I have witnessed many times that when clients are free of the negative energies and beliefs, they are able to release their brakes and become more successful than they ever dreamed. EFT Tapping has been successfully used to overcome negative emotions such as guilt and shame, fear, jealousy, and anger. It is now possible to treat phobias and anxieties, as well as self-limiting and dysfunctional beliefs and low self-esteem, in far less time with EFT. The results show up as improved relationships, better physical and mental health, and more success in our lives. EFT Tapping is a great technique to use in the area of creating abundance and prosperity. By changing our energy vibration from one based on scarcity and limitation to a new empowering vibration based on beliefs in abundance and prosperity, we begin to vibrate energetically with what we want to attract, not with what we don’t want. EFT gives us the ability to make this energy shift occur. 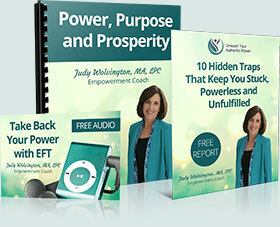 EFT is extremely effective with weight loss and addictions. Because it gets to the core issues and doesn’t simply address symptoms, it produces lasting results. Clients use the technique several times a day (it just takes minutes) to clear cravings and stay on course with their treatment plan. While EFT is still considered an experimental therapy, I have had successful results with my clients in the treatment of Depression, PTSD, Bipolar Disorder, Anxiety, and healing from childhood trauma, domestic violence, and sexual abuse. The advantage of using EFT with these disorders is that the long-term therapy process is often shortened by months or even years, and long-lasting, if not permanent, results are obtained. While EFT can be self-taught and administered, better results are achieved when the technique is learned from and facilitated by a trained EFT professional.